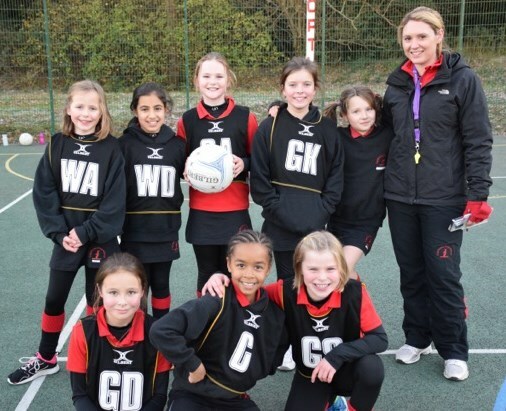 This week the U9 A netball team took on BHHS U11 B team. They were ready and excited for the challenge ahead, a taller post, a bigger ball to catch and most certainly taller players. This week Ella was our captain who got us off to the best start by winning the first centre pass. This great start was followed with a fantastic centre pass from Harley to Ffion which went straight into the circle to Biba and then to Ella who scored the first goal. What a start! BHHS then took their centre pass which also resulted in a quick goal. We were going to be in for a tough match! The score after the first quarter was 5-3 to BHHS. interceptions. The score was now 8-6 to BHHS but the girls had drawn the quarter 3-3! The third quarter was just as exciting as the first half. All girls continued to fight for every ball and were marking their players well, making it tough for BHHS to move the ball down the court. Danni, Daisy and Clara were still working incredibly hard in defence going for every interception and re-bound and not giving up. Biba and Ella were still working hard in the circle while Harley and Ffion were providing great balls in and back-ups. The score was now 11-7 to BHHS with a great goal and a great fall from Biba! The last quarter saw real determination from all players and there was no way they were going to stop fighting for the ball and playing their game. Play in the last quarter was outstanding! The girls quickly got back into their rhythm with Biba scoring the first goal. Once again Daisy and Clara were battling in defence now making more interceptions, Danni, Layla and Harley were working the ball into great spaces down the court and Ella and Biba were there to finish off the play. The final score was 14-11 to BHHS however the girls had won the final quarter 4-3! A great demonstration of a great team working hard together! This was a great challenge for our girls and I hope they learnt a lot from it. It was a great game to watch and umpire and the only difference in the teams was the height! Well done Ella, Biba, Ffion, Harley, Danni, Layla, Daisy and Clara!